Category – 70mm Log Cabins. 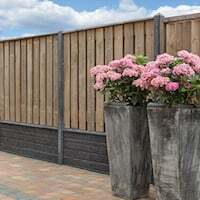 In this category you will mostly find our customer’s reviews on their Tuin 70mm log cabins and their journey to install it. We always love to hear our customers opinions on our products and believe that it creates a trustworthy community. Our posts often come with customer taken images and the occasional video overview/review of our log cabins. 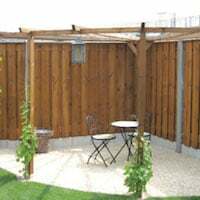 On the Ben Clockhouse Log Cabin product page, we like to give you the nitty gritties of the product in terms of dimensions, technical installation tips and the best feature of said product. 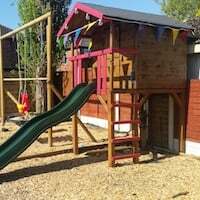 But, on this page we let our previous customers voice their opinion on the Ben Clockhouse Log Cabin and let them show you their thoughts, ideas and pictures! We may also have our team input why they desire that particular product too, so here goes. The Ben Clockhouse Log Cabin is certainly not one to mess with.. Manufactured using 70mm interlocking logs, the Clockhouse Log Cabin combines a classic English feel with a touch of Scandinavia. It measures 5.5x4m and has a side covered porch measuring 3.8m overall the building is 9.30 x 4.0m. With six double glazed windows and two sets of double doors (also double glazed) you will receive plenty of natural light in your spacious Cabin. The installation for the Ben Clockhouse Log Cabin is a simple process, so long as you keep organised. You can find loads of information in order to be fully prepared for installing your Log Cabin on the Essential Installation Manual as well as plenty of other Log Cabin Fitting Tips throughout the blog, from our expert (practically), Richard. 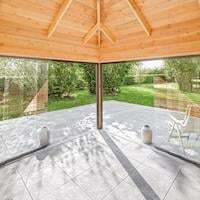 With the (almost) unbeatable 70mm thick logs, the amount of windows and natural light- the Ben Clockhouse Log Cabin is ideal for many uses like an additional living space/office and with the benefit of a covered area for outdoor dining. The cabin would be an amazing addition for use as a poolhouse. For more details such as measurements and the breakdown of what comes within the self build kit, please look at the Ben Clockhouse Log Cabin product page. If you’re not looking for a cabin with logs as thick as this, try looking at the Stian Log Cabin Feature page or even the Blackpool Log Cabin Feature page. 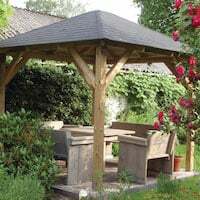 After these three it then gets very building and need specific, you may want a floor, some supports for the canopy posts, maybe an extra window or doors, perhaps you want to add an internal wall, pressure treatment, maybe you want a posh finial etc. All of our accessories can be found here: Log Cabin Accessories some of the major ones may already be on the drop down list of the log cabin you are looking at. I always forget about our annexes though so I’m writing this to show you but also to remind myself we have them, they’re at the top of the pages and I think as customers and myself whiz down the pages for a log cabin they’re looking for we both miss these handy accessories. The Lukas log cabin with a shed integrated into it. Extremely handy and many customers love it’s practical nature of design. The 45mm Wolfgang log cabin with a shed to the side and a delightful front porch. So bearing in mind we have lots of best sellers with a shed to the side we really should cater more for this shouldn’t we? Maybe more buildings featuring them? Except – I forget we do! A shed extension you can add to any log cabin, we have them in 28mm or 45mm thick wall logs. This is a 28mm extension being used with the Henning log cabin. This customer actually used it as a toilet. Here’s another view, yup he has his toilet in there. He used to be in the house all the time but since having his cabin his wife tends to lose him most days! The Asmund corner log cabin with a shed extension log cabin accessory to the rear of the build. 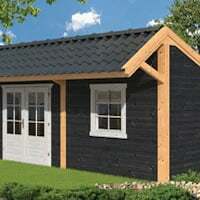 Johan log cabin in it’s standard build in 34mm logs, a lovely building as it is and very practical. Johan log cabin with a shed extension added to the front. This extension can be placed on most walls as required at installation. 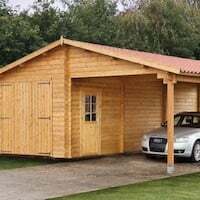 Log cabin shed extension, you can have this in two sizes in either 28mm or 45mm thick wall logs and two sizes. 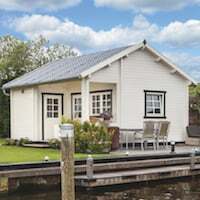 The log cabin shed extension annexes are a nice addition, you may like to consider one with your cabin or maybe you already have a log cabin and fancy adding a storage shed to it. This annexe is a simple solution and worth considering as perhaps one of the most important log cabin accessories. Mr Teague settled for the Edelweiss Log Cabin, a substantial 70mm log cabin but like a lot of our customers the base was a problem and was resolved using timber frames. One of my most favourite bases for log cabins is the timber frame and stilt method (as I call it) using this means you can easily level an area without all the expense of concrete, brick work, slabs etc. 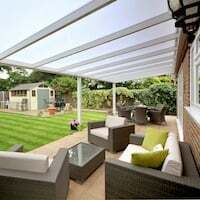 It is also a LOT cheaper, less hassle and of course extremely environmentally friendly as the ground doesn’t have to be disturbed and natural drainage is still allowed to continue. Drainage for concrete bases is often overlooked. Determining the drop Log Cabins must be level! For Mr Teague the drop isn’t massive although with this base system very large gradients can be accommodated. As I’ve said in previous posts it it vital that a log cabin is 100% level for it to be viable in the long term. Depending on the size of the building it is often easier to make the timber frames separately and then bolt them together. The size of the building will often determine the thickness of the timber used although generally the thicker the better. The basic frames are then joined together and supported on stilts, in-turn supported by slabs. 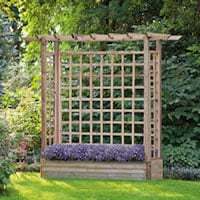 There are lots of gimmicks on the market to help you to do this but I still say you can’t beat a big lump of wood for the job, it’s also a lot cheaper than the various pads you can buy as is a slab, my recommendations are to always stick with the basic materials to save on the costs, you don’t need anything fancy to create a good timber frame base for your log cabin. With the frames in place and 100% level the build can commence, generally this base will have been made in a fraction of the time it would with concrete or slabs and of course Mr Teague didn’t have the hassle and damage that bringing concrete to site can cause to the environment and the wallet. With the build complete our recommended fitters (with a little help from me in the background) have finished the build as far as they can. For Mr Teague, his cabin completed without mess, too much money spent and time. But of course the hard work start now for him in finishing the project. When I started looking at Log Cabins my first instinct was to look at all the Internet web sites and try to find an obvious “Best Deal”. Very quickly it became clear that this was a competitive area and loads of companies were offering what seemed similar cabins at temptingly cheap prices. 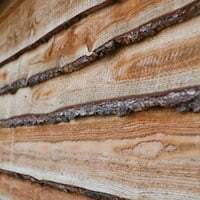 The site that brought it all together for me was Tuins excellent Blog where Richard explains in simple terms the ins/outs of log cabins and the differences between them. This was a huge eye opener and gave me the info I needed to pick what was right for me ie a solid well made cabin at a price I could justify. I chose the Edelweiss. That for me was the difficult bit over – finding a supplier I could trust. Everything else just flowed smoothly, good communication, advice on foundations and quick delivery. Tuin even found me someone to install the cabin after gently explaining that it might be a it bit much to install such a big cabin on my own! A month or so the cabin looks superb with it’s decking (I built) and sits beautifully in the garden surrounded by spring flowers. I can wholeheartedly recommend Tuin as an excellent company to do business with. Other companies may supply products that look cheaper but from my research they are not a patch on Tuins range. I have now just ordered a second (much smaller) cabin from them which I will install myself. Watch this space! After the build and the fitters have gone it’s always lovely for me to know what happens next and Mr Teague was kind enough to let me know how the log cabin then progressed and sent me these pictures of the various stages up to the completed project. The Log cabin stilt base is being extended for a decking area around the cabin still using the original concept of a timber frame stilt base. Floor joists and noggins are added using joist hangers. The end results of this project are stunning as Mr Teagues pictures below will show. I’m not sure how much the complete project cost but I know it was certainly very economical and using a base such as this will keep the costs very low when compared to the alternatives. Here are pictures of the completed project, Stunning! Another view inside. I’m not sure what the overall use of the log cabin is but at 70mm, insulated an double glazed you could live in this all year round. My warmest thanks to Mr Teague for these pictures and for keeping in touch with us after the project. Personally it makes my day seeing these pictures and knowing the full story, it also helps me to advise better and foresee any problem for future customers. As with any customers who send us these sort of stories / pictures we always send thank you presents or offer VERY good prices on next purchases. 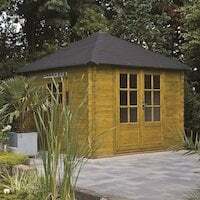 Mr Teague has now ordered the Halvar log cabin from us for use as a very nice storage shed.